It’s no secret the way we, as consumers, find local businesses has fundamentally changed. We now use our mobile phones to search for local businesses. This is especially true when trying to find a place to eat and we expect to see a full menu and reviews in order to make a decision. We also want to explore as many options as possible before choosing a place to visit. 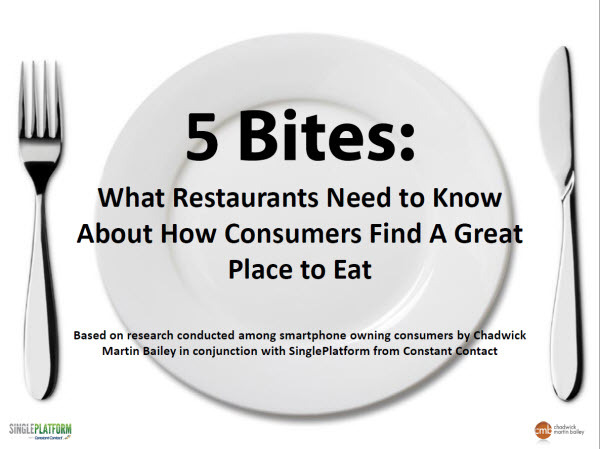 This week, new data from SinglePlatform provides insight into just how many people rely on mobile apps when searching for a place to eat. Plus, check out how the social media habits of B2B businesses have evolved in 2013. Read about these top stories and more in this week’s marketing news roundup. Bottom Line: If you own a small business, you’re probably already aware that the way customers are finding your business online has changed quite a bit in recent years. Today, 62% of small businesses think it is important to be seen on major mobile apps and 85% of small businesses believe that more people will find their business on mobile sites in the future. For restaurants, that means making sure your menu is available in all the places people are searching online. It also means finding a way to keep those menus up-to-date. LinkedIn released a major update to both its iPhone and Android apps this week—making it easier for users to access all the information their looking for from a single location. To do that, LinkedIn has introduce a new customizable navigation bar and an updated information feed—similar to what you find on the Facebook and Twitter mobile apps. Bottom Line: LinkedIn continues to make major improvements to help users get more out of the social network. With new tools to bolster the amount of great content users find on the sites and updates to help them access it even faster, LinkedIn is starting to feel like a whole new network and users should be happy. According to a new survey from research firm Hotspex, a Facebook fan is worth $174 to a brand, up 28% since 2010. The study, which included responses from 2,000 participants, compared Facebook fans and non-fans based on a number of factors including, product spending, brand loyalty, likelihood to recommend, media value, cost of acquisition and brand affinity. And while $174 is the number they came up with, that value can differ based on industry. Bottom Line: For most small businesses, attributing a dollar value to each fan is not an easy task, and that’s okay. The truth is, looking at your fans based on their individual dollar value probably isn’t the best strategy to take. That’s because you’re not on sites like Facebook or Twitter to simply sell, sell, sell; you’re there to build your community and extend the reach of your business. Your fans are people who have opted-in to seeing updates from your business in their newsfeeds. Don’t make them regret! Instead, focus on creating an experience that they will enjoy and look forward to seeing in their newsfeed each day. According to the 2013 Social Media Benchmarking Report, Twitter is the number one social network for B2B businesses. The annual report, conducted by B2BMarketing, found that 85% of B2Bs favor Twitter, followed by 82% for LinkedIn, and 71% for Facebook. Online video also appears to be gaining traction with B2B businesses, with 77% of B2Bs reporting that they use YouTube in their social media marketing efforts. And while Google+ was found to be the most effective network for only 9% of respondents, the 2013 report projects that by 2014 that number could triple. Bottom Line: Over the last few months, there have been a number of signs that businesses—both B2B and B2C—have been more willing to branch out and try new social networks for their business. Our December 2012 survey of more than 1,100 small business owners, found an increase in the number of business owners who find sites like Twitter and LinkedIn to be effective for their business. And while there’s no question that Facebook continues to be the most popular social network for most business owners, it’s clear that businesses are branching out and seeing great results. Thinking about trying something new for your business? Check out our latest Speakeasy Marketing Roundtable Podcast. 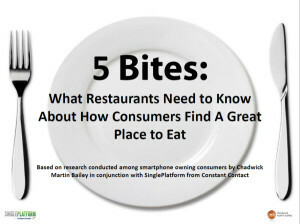 Download the full report from SinglePlatform, 5 Bites: What Restaurants Need to Know About How Consumers Find a Great Place to Eat.